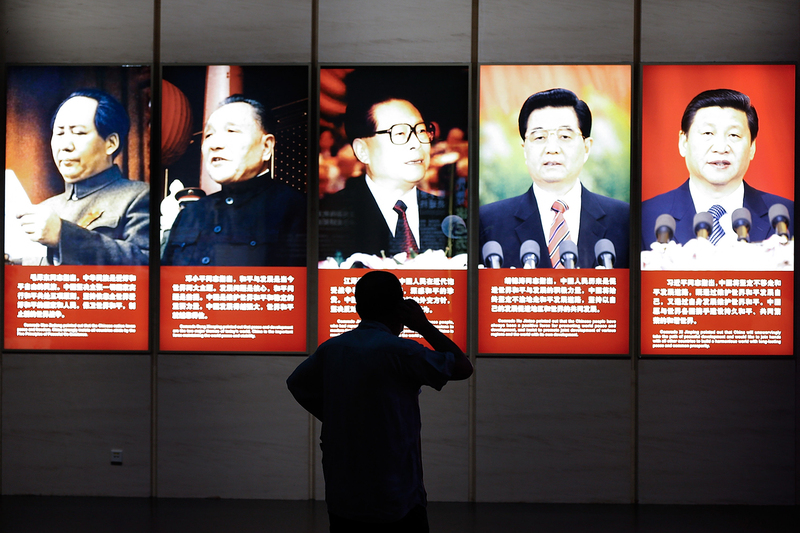 A visitor looks at portraits of former Chinese leaders (left to right) Mao Zedong, Deng Xiaoping, Jiang Zemin, and Hu Jintao, and one of current President Xi Jinping (far right) at The Museum of the War of Chinese People’s Resistance Against Japanese Aggression, Beijing, July 7, 2015. This piece was first published on the NYR Daily on September 5, 2017. Authoritarians, in China and elsewhere, normally have preferred to dress their authoritarianism up in pretty clothes. Lenin called the version of dictatorship he invented in 1921 “democratic centralism,” but it became clear, especially after Stalin and Mao inherited the system, that centralism, not democracy, was the point. More recent examples of prettifying include “The Republic of Zimbabwe,” “The Democratic People’s Republic of Korea,” and several others. What would be wrong with plainer labels? The Authoritarian State of Zimbabwe? The Shining Dictatorship of Korea? That dictators avoid candidly describing their regimes shows that, at least in their use of words, they acknowledge the superiority of freedom and democracy. Such pretenses have been useful to autocracies not just internationally but within their regimes as well, for domestic control. In 1979, I did a series of interviews with groups of Chinese writers and literary editors as part of a research project. This was only a few years after Mao had died, the government had arranged the interviews, and the atmosphere was stiff. The interviewees knew that others in their group were observing them. I was struck by how often, one after another, they used the phrase “in my personal view,” only to follow it with anodyne statements like, “Deng’s policy of The Four Modernizations is best for the development of Chinese socialism.” Why did they say “in my personal view”? Perhaps so that, in case they did say something wrong, they could not be accused of misleading a foreigner about state policy. More likely, though, I think it was to conform to the regime’s fiction that Chinese intellectuals were all free to express their individual views—even though the expressed views were boilerplate. The regime’s unvarying message to writers and editors was, “You are entirely free to agree with us,” and they were obliging. The art of controlling speech while avoiding the appearance of doing so has lasted through the ensuing decades. In the 2000s, explicit instructions went out to provincial officials that they avoid putting any censorship or blacklisting into writing. To kill an article, officials should get on the telephone and instruct editors orally. Similarly, serious speech-crime offenders—people being sent to prison for years—were charged under face-saving euphemisms: tax evasion, fraud, even “blocking traffic,” or simply “picking quarrels.” The most fearful charge, “inciting subversion of the state,” which is reserved for extreme cases, is the only one that comes close to saying what is actually happening. Though euphemisms continue to be useful to China’s rulers, it has now become increasingly obvious that their use is declining. In the era of Xi Jinping, repression is often stated baldly, even proudly. Deng Xiaoping had counseled in 1992 that the Communist Party should, for the time being, “hide its strength and prepare in the shadows.” It appears that Xi has decided that it is time to step out of the shadows. In 2013, his government’s “Document 9” warned Party members about the dangers of “universal values,” “Western-style journalism,” “civil society,” and other such ideas. Document 9 was technically classified, but it was distributed within the Party to millions of people and eventually was leaked outside the Party. In July 2015, a nationwide crackdown on human rights lawyers was similarly bald. Face-saving references to the lawyers as “thugs” or “swindlers” hardly mattered; the real message, which everyone understood, was: Here comes the Party’s power. Publisher has the right, in accordance with the publishing laws and regulations of the State, to make deletions, revisions, and additions to the Work. If changes are major, Publisher should consult with Author to obtain agreement. If Author refuses to revise or, after repeated revisions, has failed to satisfy Provision Two of this agreement, Publisher has the right to cancel the contract. If ten years earlier political censorship was done by telephone, now it is out on the table, in writing. Should Publications Compromise to Remain in China? Editors at the Chinese online magazine Caixin (“wealth anew”) saw an essay I had written in memory of my beloved first-year Chinese language teacher at Harvard in 1963; they wanted to publish it but said they would have to strike two sentences in which she referred to the 1989 Tiananmen massacre. They did not want to do it but said they had to: “Such words are forbidden and there is not the slightest room to negotiate.” The piece was published elsewhere. It’s no big deal if a few barely-read China Quarterly articles cannot be found on China’s Internet. The real issue is that the fundamental principles of the two sides are in conflict, and the question is: Whose principles are a better fit for today’s world? This is not a matter of “each to his or her own”; it is a contest of strength. In the end time will tell who’s right and who’s wrong. The Global Times here treats the China Quarterly issue as a small matter, important only as a symptom of a much broader struggle over what kinds of states and societies are right for the world in the 21st century. On this point I agree with the Global Times. That larger struggle is indeed the main issue. It has been on the minds of the men who rule in Beijing for a long time, at least as early as Deng Xiaoping’s advice in 1992. From this perspective, the China Quarterly troubles could be viewed as good news: they might awaken a naïve West to what is really going on. If the Communists succeed once again in leading China down a disastrously mistaken historical road, the results will not only be another catastrophe for the Chinese people but likely also a disaster for the spread of liberal democracy in the world.